Welcome to Day #4 of Chocolate and Seeds Theme Week. Most of the seed items in this year's seed week seem to contain pumpkin seeds. More pumpkin seeds are being used with chocolate and energy bar items; however, this finding was also linked to what was available in local shops that I hadn't tried before. Today's Dark Chocolate Pumpkin Seed with Sea Salt from barkThins were manufactured for Ripple Brand Collective, LLC (New York, NY). The brand was acquired by Hershey in 2016. A generous helping of dry roasted and salted pumpkin seeds were embedded in slim sheets of dark chocolate. 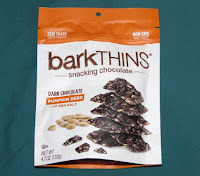 The seeds gave this bark a satisfying crunch and contributed a seed flavor and aftertaste. *Pumpkins are now grown on every continent but Antarctica. While China is likely the top producer of pumpkin seeds; Ukraine, India, the U.S. and Mexico are also significant producers.